Carlos Perrett ’18 leading a campus tour. 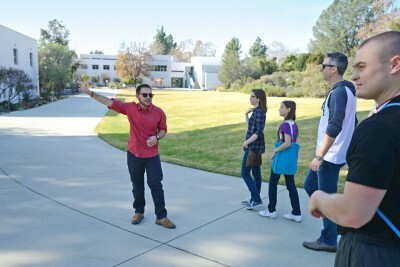 Claremont, Calif. (June 12, 2015)—Eighty high school students from Texas will get a taste of college life in Southern California when they visit Pitzer College and the adjoining Claremont Colleges the week of June 15. The group is from the EMERGE Fellowship, a Houston-based nonprofit that helps students from underserved communities get into, and graduate from, the country’s top colleges. The visit is part of Pitzer’s efforts to increase college access for low-income, first-generation and minority students. Through its Pitzer Pathways Initiative and other programs, the College’s Office of Admission partners with community-based organizations (CBOs) like EMERGE that help teenagers prepare for college entrance exams, hone interview skills and navigate the application process. EMERGE’s founder, Rick Cruz, was the winner of the 2014 Pitzer College Core Values Award, which the Office of Admission gives to a high school educator whose work exemplifies Pitzer’s guiding principles. Students from EMERGE will spend the afternoon of June 16 on Pitzer’s campus. In addition to a campus tour, they will talk with current Pitzer students and have opportunities to discuss service learning and community engagement at Pitzer, visit labs at the W.M. Keck Science Department, paint the free wall and meet day laborers who improve their English language skills by interacting with Pitzer students. Pitzer Admission Counselor Katie Shepherd says spending time on campus gives students invaluable experiences they can’t get from merely visiting a website. “It lets you feel like you’re already part of the community,” she said. Carlos Perrett ’18, a former EMERGE participant who helped arrange the nonprofit’s visit, recalled how it felt when he went on his own college tour with the program. Perrett was one of the first students to come to the College through the Pitzer Pathways Initiative. Now he works for the Office of Admission and sends photos to high school students in Houston to encourage them to pursue higher education. After spending an afternoon on Pitzer’s campus, he hopes EMERGE participants will find it even easier to picture themselves as college students and, eventually, college graduates.